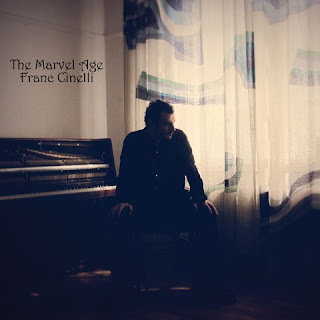 Franc Cinelli’s new album The Marvel Age shows an artist continuing a determined path, not afraid to take chances and experiment. At its core this is a folk record, but its use of rhythms, the twists and turns in the arrangements with their vibrant colours and haunting undertones, create something much more. The album was written over the course of Cinelli’s extensive tour in 2013 and 2014 playing throughout the UK, US and his native Italy. The people and places of that tour, from the Strait of Messina to England’s North East are all present throughout these ten songs, as is much of the listening material from the tour, from T Bone Burnett records to the mesmerising Sahara Blues. The album was recorded in his London studio, enlisting the help of his live band Laurence Saywood on bass guitar and Drew Manley on drums. Following his previous record with Morrissey and Coldplay producer Danton Supple, Franc took the step of recording and producing his own music at his London studio where he also continues to produce a crop of new talent. The extensive 12-month tour promoting his last record I Have Not Yet Begun To Fight, which gave birth to this new album, saw him playing shows across UK, Europe and North America. Including sold out shows in New York and London, along with a televised performance at the Blue Note in Milan and two shows at the Royal Albert Hall. He’s gathered support from BBC Radio 2 to WFUV in New York and everywhere in between.